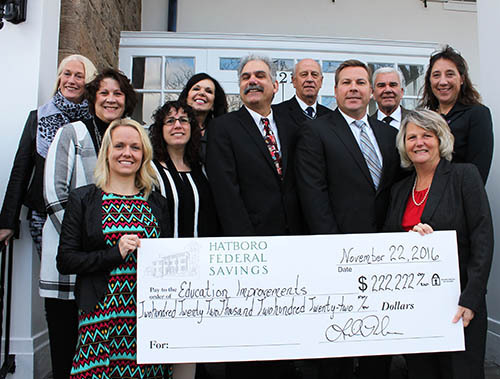 (HATBORO, Pa.) Hatboro Federal Savings, one of the area’s leading community banks, announced a $222,222 donation earmarked for eight local organizations that meet the criteria for Pennsylvania’s Educational Improvement Tax Credit Program (EITC). The EITC allows tax credits for eligible businesses that contribute to a scholarship, educational improvement or pre-kindergarten scholarship organization. The 2016 recipients of Hatboro Federal’s EITC contributions are Big Brothers Big Sisters of Bucks County; CB Cares; Centennial Education Foundation; College Settlement; Hatboro-Horsham Educational Foundation; Lower Moreland Educational Foundation; the Union Library of Hatboro; and Upper Moreland Educational Foundation. Roehner added, “It gives us great pleasure to support the Hatboro Horsham, Lower Moreland, Upper Moreland and Centennial Educational Foundations, whose missions are to enrich and enhance educational opportunities for students through special classroom programs, creative outreach programs, state-of-the-art instructional techniques and more. At Hatboro Feceral, we consider the education of our children to be a top priority. The more we can motivate and excite them about learning, the better,” adds Roehner. problems in their daily lives. The Union Library of Hatboro is the second oldest library in Pennsylvania, serving the community since 1755. They will use their donation to provide resources for their children’s programs. Hatboro Federal Savings was chartered by the Federal Home Loan Bank Board in February 1941, and has current assets of more than $505 million. Headquartered at 221 S. York Road, in Hatboro, PA, Hatboro Federal also has branch offices in Warminster, Warrington and Jamison, offering financial products and services to individuals, families and businesses. In 2016, Hatboro Federal is celebrating their 75th year in business and in service to the community. To learn more, visit https://www.hatborofed.com. From Left to Right are representatives of eight organizations that received a donation from Hatboro Federal Savings in November. All of the recipient organizations meet the criteria for Pennsylvania’s Educational Improvement Tax Credit Program (EITC). The EITC allows tax credits for eligible businesses contributing to a scholarship, educational improvement or pre-kindergarten scholarship organization.